Custom Metal Sign . . . Customized and Personalized!! A Custom Metal Sign . . .
A Sign Your Ready To Do Business! What are the advantages of a custom metal sign? How can I make signs that are customized for me? Do you want to make your own personalized sign? Why not? Wet Jet Precision, Inc. can help make it a snap! Metal signs are made to last for years. They are the sign of choice when you need a durable and light-weight sign for a building, post, or gate entrance. Don't limit their use to exterior only. Custom metal signs are available for a host of applications. Metal signs never rot or depreciate like the traditional wooden signs. Not only are they a good idea for metal addresses, but they are also a great way to enhance your entrance. From Custom Sign Manufacturing of your Logos to architectural esthetics, Wet Jet Precision can create interior and exterior Custom Business Signs for a variety of industries from your favorite metals. We blend technology, design, and craftsmanship to create a long lasting product. Are you looking to make Funny Signs, or humorous sayings out of metal? Materials can be cut to any size, and a wide range of Fancy Lettering, or fancy fonts and graphics can be used. Some of the common materials our customers use include Non Ferrous Metals (mild steel), Stainless Steel, and Aluminum Alloys. Aluminum signs have the advantage of being light, and yet they will stand the test of time. Other typical materials include titanium, copper, brass, and bronze. Powder coating a metal sign is the Industrial Metal Finishing technology typically used by consumers, businesses, and industry. It is a very durable, yet cost effective solution available for use with virtually any type of metal. Once the coating process is completed, you will see a high quality eye-catching surface that is resistant to chipping, scratching, corrosion, fading, and wearing. The anodizing process, is a solution that was invented for aluminum, but is not typically used for non production projects . . . onesy-twosy type stuff. I need a custom metal sign for indoors . . .
Not a problem! We create a host of metal "Welcome" type signs, with unlimited words and sayings. 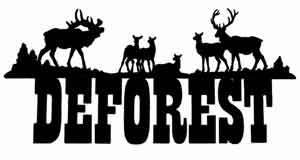 Or a lot of folks have us cut Silhouette Art of various wildlife. These metal cutouts are then memorialized at the bottom or top with the names of hunting buddies, and the date when the big one was bagged, etc. These signs are characteristically very rustic. They typically are used to enrich and enhance that game room, or country home, lodge or cabin. Interior Design Ideas involving Metal Wall Decor themes are great for decorating kid's rooms, dens, garages or barns. These thematic custom metal signs and silhouette cutouts are also great retro decorating ideas for your home bar or business. Check out our Home Decorators Collection, and/or add your design project to it after you are finished. They are also absolutely perfect for unique Personalized Birthday Gifts that do not fade away. Designs can be commissioned to suit your specific purposes. We can use and create just about any design from a picture that you may have. 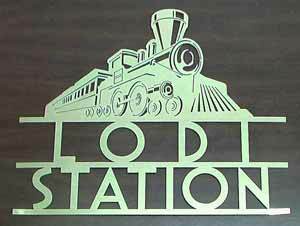 The Wet Jet Precision team can design and produce just about any type of metal sign you can envision. We will facilitate that one-of-a-kind look you desire. Our custom signs vary in size and design. Your slogans and business logos are valuable for carrying the message of your brand. All of our metal signs are "custom"(er) designed to meet your specific requirements. Custom metal signs are the application of choice for business and industry. They are extremely durable and cost effective. They are a great way to send that "Touch of Class" message, whether at the gate, or the door, or in that special room. Give us a call, or for Abrasive Waterjet Cutting . . . Contact Us to add a classy touch of wall art. Or pamper yourself, a friend, or a loved one for that special room, or special occasion. I look forward to serving you!